We are two Fulbright grantees from France, Farah and Raphaële. We met in Paris during the pre-departure orientation meeting organized by the French Fulbright Commission, and decided to meet up again in New York at the beginning of the academic year. Since then, it has become a tradition for us to see each other almost every weekend to explore the city, share our stories over a coffee, or talk about our intercultural experiences in the US. For Thanksgiving, we decided to try One to World’s offer to spend the day in an American family and to share the traditional Thanksgiving dinner with them. 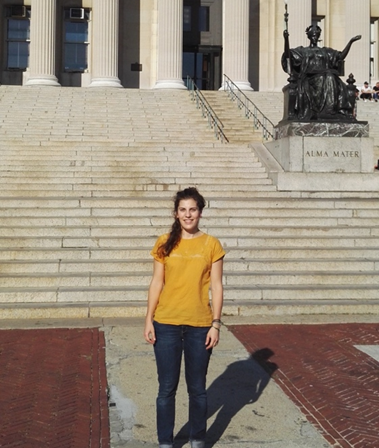 Raphaële is on the Fulbright-Schuman scholarship and is a Ph.D. researcher on exchange at Columbia Law School, where she works on equality and non-discrimination law. 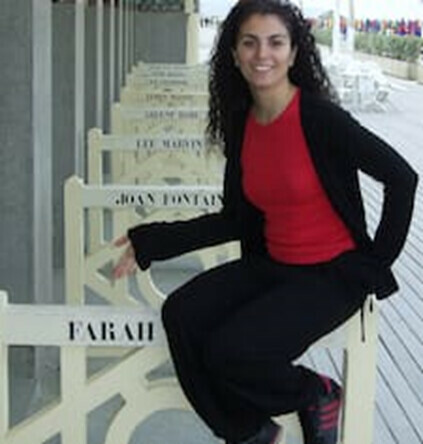 Farah is on the Fulbright-France scholarship and is an Ph.D. researcher on exchange at the NYU, where she studies American politics and alternative media. 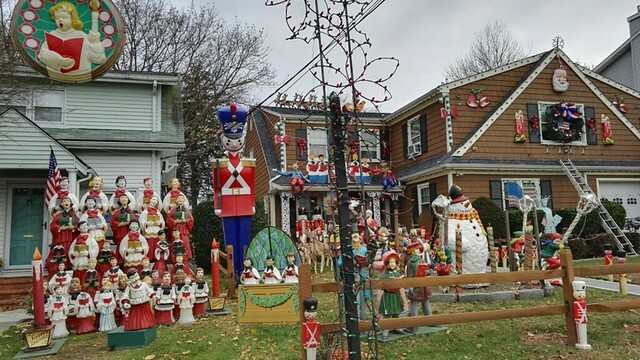 We were hosted by Scott and Ann-Marie Damashek in their house in Harrison, Wetchester County, NY. After a 45-minutes train ride, we arrived in Harrison where we took a stroll to explore the town. The first discover we made was an American version of the house of Hansel and Gretel. We arrived at the Damashek’s place around 2:30 pm, where great company and tons of food awaited us. During the preparation of the dinner we met the jolly group of friends invited to spend Thanksgiving with our host family and ourselves. We had great discussions and learned a lot about American traditions, US and local politics, the way of life in Upstate New York, and American football. We were surprised to find out that most of them were familiar with French or French culture. John – a former chef – had even worked for Paul Bocuse in Lyon, which is really impressive. 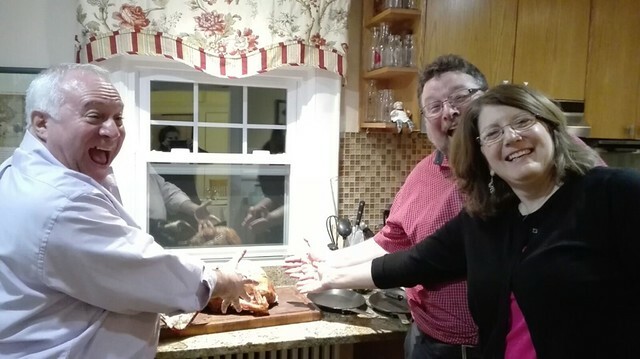 We were told the secrets of a successful Thanksgiving dinner while spying Scott, the great cook, taking care of the turkey in the kitchen. 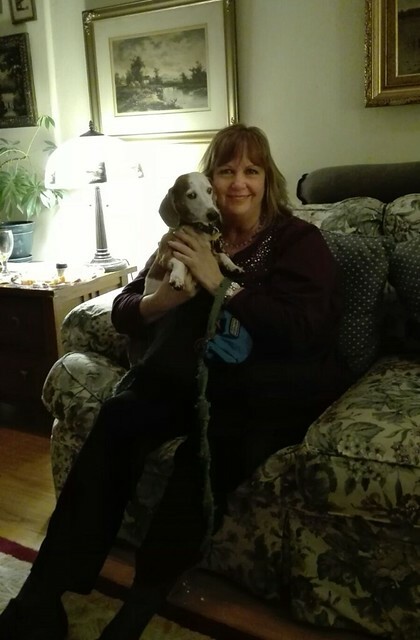 In the meantime, we were also introduced to Liz’s elegant blue-eyed dachshund Hawkeye Pierce. Envious of the various delicacies we got to try, the dog went in search for his fair share of Thanksgiving traditions. While trying to prevent him from stealing our appetizers, his owner Liz explained us that his name was taken from the famous movie, and later TV series, M.A.S.H. In this 1970 satirical black comedy movie about a Mobile Army Surgical Hospital (MASH) during the Korean war, Captain Hawkeye Pierce, armed to the teeth – but only with black humor – constantly plays pranks around him, shedding light on the absurdity of the war. Driven by the same playful spirit, Hawkeye Pierce – in its animal version this time – contributed to the fun atmosphere of the evening. Suddenly, at around 5:30 PM, the table got covered from a plethora of dishes, each one more appetizing than the other! Nothing was missing: turkey, stuffing, gravy, cranberry sauce, mash potatoes, green beans casserole, but also smoked salmon, roasted lamb, Brussel sprouts, sweet potatoes, and more. We counted a total of twelve different dishes on the table! We were explained the content of each dish and, as the tradition requires, went around the table to tell each other what we were thankful for. Our thoughts went to health, our family, friends, new life opportunities, the Damashek’s hospitality and sense of sharing. We took a fun test on our knowledge of the origins of Thanksgiving before we started eating. Ready? Steady? Go! We literally devoured the diverse delights, after which we made a short digestive break with some American liqueurs. We enquired into the differences between brandy, bourbon, and others. After some explanations about labels of origin and distillation processes, we went on for the desserts. There again, we could not believe that there were so many different items on the table. 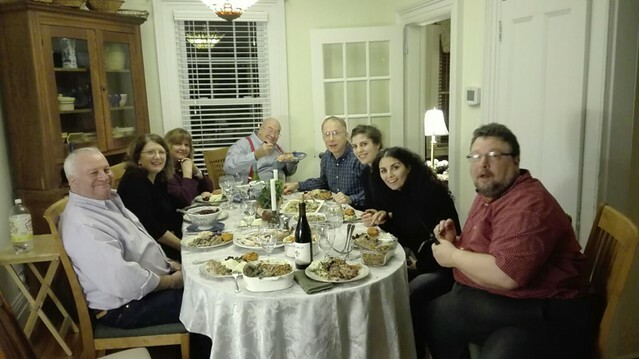 From the Italian specialties brought by former chef John – Naples specialties ‘Pastiera’ pie and ‘Zeppole di San Giuseppe’ cakes – to the American traditional pumpkin pie and cinnamon apple cake, we brilliantly ended this Thanksgiving dinner with a touch of globalization. Your turn to come over! After exchanging some more life stories, jokes, recipes and our contacts, it was time to say goodbye to our hosts. We thanked Ann Marie and Scott for a terrific afternoon and evening at their place, for their incredible hospitality and sense of humor and for making our US experience so special during Thanksgiving. 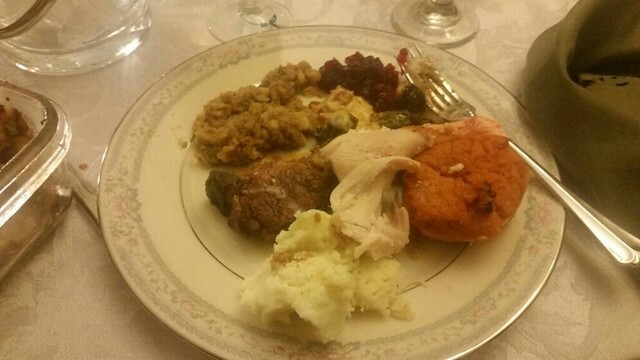 The magic of Thanksgiving and our hosts’ generosity gave us a feeling that we were home with friends and relatives. We are ready for next year and hope to see them again very soon, or – who knows – maybe to have the pleasure to host them in France next time they cross the Atlantic! We are also very thankful to the Fulbright program and to One to World for respectively funding our stay in the US and allowing us to discover so much about the US culture!